KUALA LUMPUR: The Malaysian property market hit a record year in 2010 with RM107.44 billion worth of properties transacted and the trend will continue this year. "There will be an increase this year, but marginally," said National Property Information Centre (NAPIC) director-general Datuk Abdullah Thalith Md Thani. The property market enjoyed double-digit growth in 2010, with transactions and value expanding 11.4 per cent and 32.4 per cent to 376,583 and RM107.44 billion respectively. Residential property dominated the overall market, taking 60.2 per cent of total volume and 47.1 of the value of transactions. Abdullah Thalith said NAPIC expects the property market this year to benefit from the various economic initiatives undertaken by the government. Projects such as the Kuala Lumpur International Financial District, mass rapid transit in Greater Kuala Lumpur, Warisan Merdeka, the development of federal land in Sungai Buloh and the redevelopment of Pudu prison, which are expected to be implemented this year, will have positive spillover effects, he said. Abdullah Thalith said the unrest in the Middle East and Japan, which was hit by tsunami, will not dampen growth as he expects the Arabs and Japanese to continue buying here. 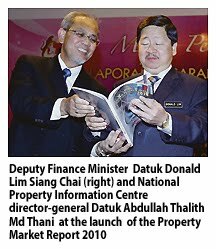 He was speaking at the launch of the Property Market Report 2010 by Deputy Finance Minister Datuk Donald Lim Siang Chai here yesterday. The report showed that in terms of pricing, the Malaysian All House Price Index surged by 8.9 points to 140.7 points. Lim said Malaysians should not worry about a property bubble as the situation is under control. He urged all states to speed up the process of approving property transactions, especially for leasehold units. "A lot of states, especially Selangor, are slow in doing this. We have a lot of foreigners buying leasehold properties here. We must address the issue as the foreigners are bringing in money. This will lift the economy," he said.